I am a 100% making this up, take it with a grain of salt! So who are we stanning? 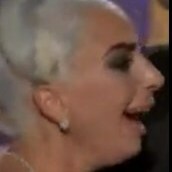 it'd be cool if the staff and gaga notes were the album cover with no words. it would be as cool as that pink floyd rainbow cover.